Let's face it: Some people are just better at coming up with Halloween costumes than the rest of us and this custom made Star Wars speeder from Return of the Jedi is one of the best fan made creations ever. Not only is the timing perfect for Halloween, it's also perfect timing to capitalize on the hype surrounding the upcoming release of The Last Jedi. The couple behind the creation have said that they are trying to win Halloween and it looks like they've done it. YouTubers Jesse Wellens and Casey Neistat are responsible for the Luke Skywalker, Stormtroopers, and Princess Leia Endor costumes and speeders. This is not just some thrown together at the last-minute project. It took a team, named Super 73, quite a while to complete the speeder and the results are pretty magical for any fan of Star Wars. The Speeder bike doesn't really float or fly, it's actually built on a custom electric motorcycle chassis that was created by the aforementioned team Super 73. A set of mirrors placed over the wheels do an amazing job of camouflaging them to look like the speeder is floating rather than driving around on the street. 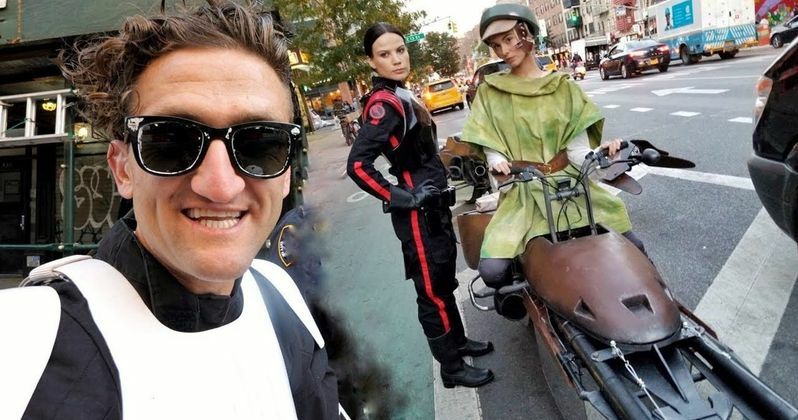 Jesse Wellens and Casey Neistat reenacted the famous speeder chase seen on Endor from Return of the Jedi, but with some New York City flair thrown in. The video shows the speeders zipping around New York City and being chased by a Stormtrooper who had previously been seen eating a bucket of KFC. The video doesn't do the Star Wars speeders justice as the reactions from the people on the street are priceless. Little kids freak out, but adults are way more excited to see the speeders flying through the busy streets. New Yorkers take out their phones for pictures and call their friends to get down to the street and see the action for themselves. Not only are the Star Wars speeders incredibly well done, but the costumes are as well. We see the period specific Stormtrooper chasing after Luke and Leia in what almost look like movie quality costumes, with one kid on the street yelling "Leia!" While it's all fun and games, the two speeders get pulled over by a police officer and they're all arrested at the end. The mock arrest adds to the humor as we see the Rebels getting arrested side by side with the Empire. After securing the proper permits, permissions and hiring a professional company, Neistat and Wellens used drones to capture aerial footage of the speeder moving through the streets of Manhattan. The main video is just over 2 minutes long and then there's a longer behind-the-scenes video that shows all of the hard work and effort that went into making the 2-minute video. You can check out the original epic video that shows the Star Wars speeders zipping through Manhattan like it was Endor as well as the behind-the-scenes video below, courtesy of Casey Neistat's YouTube channel. We also have video of a cool Silver Surfer video just for fun.